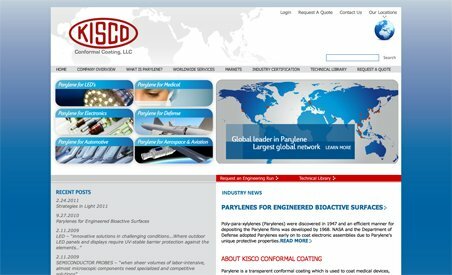 Kisco is a worldwide leader in parylene conformal coatings and customizable coating solutions. They distinguished themselves by pioneering a new variety of parylene materials that are currently being used by hundreds of companies around the world. Their diX parylene dimers are the purest in the world (about 99%) and result in less residual coating and a more efficient and precise coating process. Kisco offers more than 11 types of parylene materials, with new varieties under continuous development. Kisco is a worldwide leader in parylene conformal coatings and customizable coating solutions. They distinguished themselves by pioneering a new variety of parylene materials that are currently being used by hundreds of companies around the world. Their diX parylene dimers are the purest in the world (about 99%) and result in less residual coating and a more efficient and precise coating process. Kisco offers more than 11 types of parylene materials, with new varieties under continuous development. As a global innovator in the field of parylene coating materials, Kisco is ideal for companies requiring the latest technologies and services.